Fanfare Magazine, which is billed as, “The Magazine For Serious Record Collectors,” has published a review of Washington Master Chorale’s first CD on Albany Records, The Earth and I in their May/June 2014 issue. The piece was written by London-based reviewer Colin Clarke, manager in the classical department of a record shop at No. 1, Piccadilly, London. Clarke has studied musical theory and analysis at King’s College, London (KQC). He has also worked on the editorial teams of Gramophone and International Record Review, and has acted as a discographer for the MCPS (Mechanical Copyright Protection Society) as well as an expert listener for the Consumer Association. Throughout his review, Clarke discusses both the composers and the poetry they used for their writings. He frequently calls out the Chorale’s performance of those pieces. Clarke also called “…the choral sound positively gorgeous” while referring to the Chorale’s performance of selections by Samuel Barber, Kirke Mecham and Rose Lee Finney. 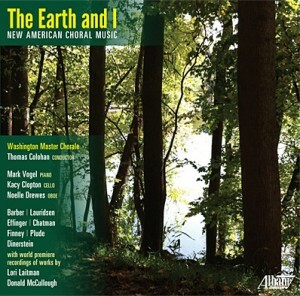 Under the direction of artistic director Thomas Colohan, the Washington Master Chorale’s The Earth and I can be purchased online from Albany Records and is available from Amazon and iTunes.